Star Wars Day is the gift that keeps on giving. What better time is there to celebrate your love for all things from a galaxy far, far away *and* splash the cash on some of the best Star Wars gifts around? Never, that’s when. With the Han Solo movie just around the corner – and Star Wars 9 closing in – you’re going to want to stock up on all things Star Wars, because you can never have enough in the way of Lego sets, themed lights, and, yes, even Star Wars Monopoly. That’s not all. In fact, there’s something for everyone here: Chewie hoodies to keep you warm when the weather turns more Hoth than hot, Funko Pop figures (including the latest The Last Jedi line), and even a buddy BB-8 for you to take for a spin whenever you see fit. What are you waiting for?! Scroll down for the latest and greatest Star Wars gifts for you or a loved one (but, let’s be real here, you take priority). You don't have to fill them with, err, Blue Russians, but these Star Wars Tiki glasses take your love of the series to a whole new level. Exclusive to ThinkGeek (and currently reduced) these Tikis are ceramic and ideal for cocktail parties. Just include the Cantina music and you'll be good to go. It's definitely one of the more expensive Star Wars Lego sets out there, but just think how much use you can get out that thing. Build it, play with it, watch it splinter into a thousand pieces after accidentally dropping it, and then repeat the three act tragedy all over again. It's a Lego tradition. Yes, these are the droids you’re looking for. 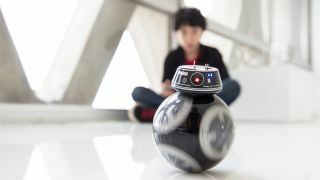 Complete with all the right sounds, these BB-9E, R2-D2, and BB-8 droids can be controlled via your phone and even come with their own AR experiences for you to see inside digital recreations of select Star Wars ships, one of which is Snoke’s Star Destroyer. Plus, they're super cute. Did you really think there could be a new Star Wars movie without any Funko Pops? Collectors prepare to buy a whole new cabinet for Funko’s positively intimidating array of traditional models and adorable bobbleheads known as Wobblers. From Porgs with nodding heads to First Order Executioners, the tie-ins for The Last Jedi are catnip for Star Wars fans. So what if it's not considered canon anymore? This animated series still holds some of the best Star Wars stories of all time within its epic saga, including a reanimated Darth Maul! With robot legs! Sure, you could spend £700 on a 7500 piece Millennium Falcon, or just spend a little less on this impressive Lego First Order Heavy Assault Walker. At an impressive 13 inches tall, it comes with studular versions of Poe Dameron, Rey, a Resistance Trooper, First Order walker drive, and a First Order Stormtrooper. Who needs Wally or Waldo when there's a Wookiee to be found? Incredibly, there's even an actual plot excuse as Chewie is hunted down by the Empire and you have to spot him on each page before the best bounty hunters in the galaxy find him instead. There's even plenty of other characters to spot once you've seen everyone's favourite Wookiee on each page. Jump into the galaxy far, far away through the power of interactive entertainment, with this ultimate Star Wars gaming packing. This slightly rarer crystal white PS4 Slim has 500GB of space (or 1TB for US customers) for you to fill up with games, the first of which will be Star Wars Battlefront 2, as it comes bundled in with this special edition for a slightly discounted price. You might be an ace pilot or a master of the Force, but how's your hand in the property market? This Star Wars themed Monopoly set is unlike any other, boasting a unique board shape and new collectable items that change up the traditional style of play of this classic capitalism simulator.